Special Containment Procedures: SCP-585-2-4 are to be kept in a standard hazardous-object containment at Site-19. Pencils modified by SCP-585 are extremely dangerous and should be returned to their normal state at the end of testing. As of Incident 585-1, no pencil should be sharpened for more than fifty (50) rotations without O5 level approval. SCP-585-a is stored in a glass vacuum flask, which is locked in storage vault ██. Special authorization by Dr. ████ or any senior Foundation staff is required for experiments involving SCP-585-a. 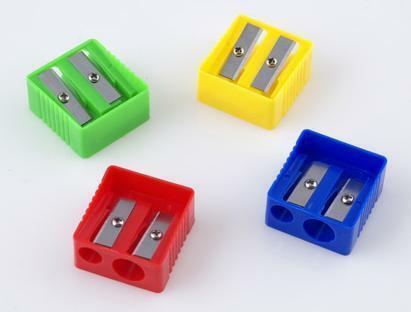 Description: SCP-585-2-4 are small, two-hole pencil sharpeners made of brightly-coloured plastic. ‘The Factory’ is printed in slightly raised text on the undersides. Any pencil inserted into the small hole of SCP-585 and turned clockwise will be sharpened, as is normal for a pencil sharpener. However, with each rotation the ‘sharpness’ of the pencil’s point continues to increase without any apparent limit. Any pencil sharpened by SCP-585’s small hole that is then inserted into the larger hole and turned counter-clockwise is ‘unsharpened’ with each rotation undoing the effect of one previous rotation in the small hole. (Only the shape of the pencil is changed — lost mass from shavings is not restored.) The tip of affected pencils can be broken off, but the point will retain its sharpness and remain dangerous. Preliminary testing indicates that never-sharpened, ‘flat’ pencils reach the normal maximum sharpness a sharpener can achieve after twenty (20) rotations. From this point on SCP-585 will shave exponentially less mass off of the pencil with each rotation. At thirty (30) rotations, a pencil dropped from one (1) meter embedded itself by ten (10) centimeters into a solid steel bar. SCP-585 works best on thin cylinders of wood cored with graphite. SCP-585 will also function with other easily shave-able materials such as plastic or paper cored with graphite, or with a pure graphite stick. Pure wood or plastic does not produce the effect, nor does any material that cannot be shaved by an ordinary pencil sharpener. SCP-585-1-4 were recovered from an elementary school in ████ after [DATA EXPUNGED]. Incident 585-1: A standard HB pencil, never used, was chosen for extended testing of SCP-585-1. Pencil is now designated SCP-585-a. - After thirty (30) rotations, SCP-585-a was confirmed capable of piercing steel. A sheet of paper was sliced in half by the point. - After forty (40) rotations, SCP-585-a was attached to a string and dropped from one (1) meter’s height onto bedrock. SCP-585-a penetrated 0.5 meters. - After fifty (50) rotations, the same test as above was performed. SCP-585-a penetrated five (5) meters of bedrock. - After sixty (60) rotations, SCP-585-a penetrated fifty (50) meters of bedrock. Testing continued until at exactly one hundred (100) rotations, SCP-585-a’s tip began radiating extreme heat, causing its wooden component to burst into flames. Further testing on the graphite core [DATA EXPUNGED]. The item was deemed too high of a risk to keep, considering that another could be easily created, and SCP-585-a was inserted into the large hole of SCP-585-1. The extreme heat caused SCP-585-1 to melt. SCP-585-a placed in a vacuum flask for storage.